Luton boss Nathan Jones remains hopeful of making one last signing ahead of next Thursday’s transfer deadline. 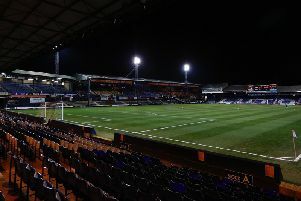 The Hatters chief has managed to bring in four new players over the summer, Matty Pearson, Sonny Bradley, Jorge Grant and Andrew Shinnie, before missing out on addition number five last week. However, Jones is remaining optimistic, as long as the right one becomes available, as he said: “We are looking to add to the squad, but the trouble is, there are a number of players available that we can take, but whether they can improve us is another thing. “Even if we’re prepared to take a loan, most Premier League or Championship sides or top loans, they want to play and I can’t guarantee that because of the strength of the squad we have. “I’m very happy with my squad, so if we don’t bring anyone in, it’s not a problem. “What we would have liked to do is to be covered in every single area, in terms of whatever we do and however we want to play. “So there’s a particular type we’d like to bring in, if we don’t get that, fine, we have ones in the building and we have group now that’s close, that’s strong and very, very talented.